Do you have experience working with Bizopia? Do they deserve to be on the top of the Best Web Design Companies list? What do you think of Bizopia? Leave a comment below. When reviewing the web re-design for clothing and gear retailer Robyn’s Nest, it’s important to keep in mind this is NOT an online store where you add things to your digital shopping cart and they show up on your porch three days later. 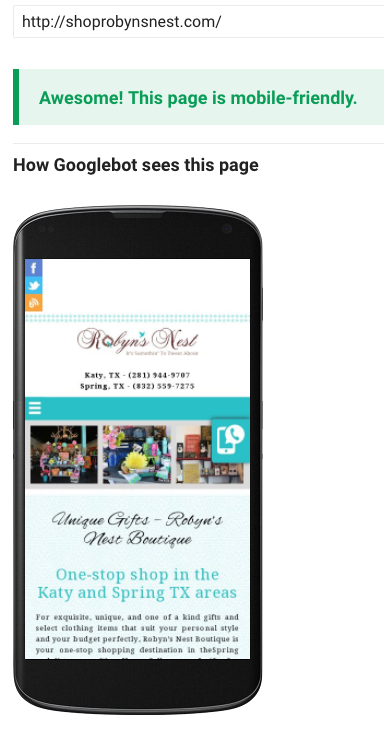 Robyn’s Nest is a small business with two brick and mortar street fronts, and a whole lot of South Texas charm. When framed in that light design and marketing company Bizopia did a sufficient job in embodying the flavor of the in-store experience, while giving the website the clean, modern update it desperately needed. The home page is clean and vibrant, featuring a truncated horizontal slideshow of images taken from the store’s displays. Bizopia did well to highlight a variety of items, showcasing in a single broad stroke the breadth of offerings each Robyn’s Nest store has. If there’s one criticism of the initial design work it would be the italic cursive font used for some of the titles. It appears to be trying to mimic the specialized font used in the Robyn’s Nest logo, but it’s just enough off that it throws the cohesiveness of the aesthetic through an unnecessary loop. 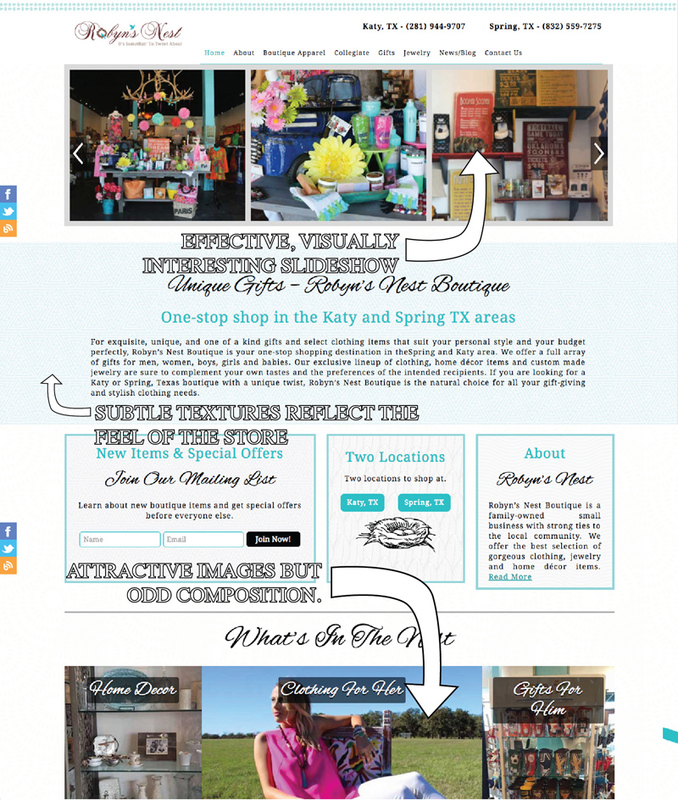 Navigation through other sections of the site is easy and handled almost entirely through the top menu. Although, I could see how users might get frustrated with the lack of specifics when it comes to the actual items sold in stores. Each browsing section gives a general description of the types of items and even brands they carry, but there is a disappointing lack of actual merchandise that would be nice to thumb through. As I mentioned, this isn’t an online store and that’s perfectly okay, but having the ability to zoom in and out of what the store has to offer would have been nice. Bizopia did a nice job carrying a constant feel and color-scheme throughout the pages. Subtle background textures reflect patters found throughout images of the store and add a nice bit of visual intrigue to the experience. There are few frills or animations, which is actually a welcome omission as the content on the site never really warrants such indulgences. The site is lean and quick, and has just enough window dressing to embody the spirit of Robyn’s Nest. Success! From our experience the mobile version of the site worked better than the web version from a design standpoint. Our minor issues with composition and font selection somehow disappears in the hands of a phone (tested on iPhone 6). The mobile design is responsive, attractive, and offers a pleasant viewing and navigating experience. Not the best we’ve seen, but certainly not the worst. Empirically, the site never showed to be slow when we were browsing through it. Bizopia did a good job to update a dating site with a brand new coat of digital paint. The site truly does embody the look and feel of the Robyn’s Nest brand, and the site shows a strong sense of aesthetic cohesiveness. We had a few issues with composition and font style on the homepage, but those marks cleared up nicely when viewed on a mobile device. It would have been nice to see a few more specific examples of what the stores have to offer, but it’s an understandable omission when stacked against what the website is aiming to do.